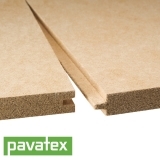 Since 1932, Pavatex has been specialising in manufacturing high quality sustainable woodfibre insulation board. 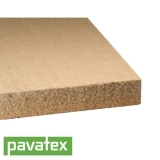 Pavatex has a number of insulation products suitable for roofs, walls and floors, all of which offer great thermal performance as well as noise insulation, with minimal environmental impact. 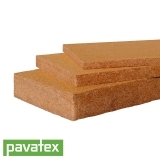 Isolair is a wood fibre permeable sarking board from Pavatex, with tongue and groove edges and insulating properties. With up to 0.044 W/m2K to help you meet building regulations, it can also be exposed to weather for up to 3 months during construction due to its naturally water repellent layer, and is the perfect solution for application in exeternal walls in timber constructions. 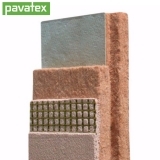 Pavitherm-Combi from Pavatex has a wide range of potential applications. 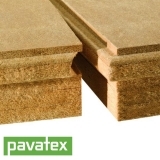 Pavitherm-Combi comes with a tongue and groove edging, which makes it easy to install over and under rafters. For a complete efficient insulation system, you can combine Pavitherm-Combi with Isolair and Pavatherm Plus. 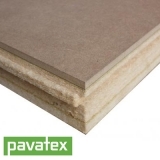 Pavatherm Plus combines the Isolair sarking board and Pavatherm insulation board. Combining permeable roof insulation with integrated sarking board offers up to 0.041W/m2K as well as noise reduction, and can be used internally for insulation purposes, but also externally as wall insulation in solid and timber constructions that have clad walls. Diffuboard is mostly used on timber constructions that are pre-fabricated, and consists of an external woodfibre insulation board with a tongue and groove fitting for easy fitting. Diffutherm is an external woodfibre insulation board that is fastened on with brackets or insulation anchors. The sandwich construction of Diffutherm increases its stability. 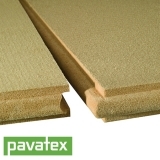 Pavadentro is a product specially designed to insulate internal faces of external walls in environmentally conscious builds, using woodfibre properties to prevent moisture build up and condensation. Pavadentro is most useful in building and restoration projects where external insulation isn’t viable for listing or environmental restrictions. 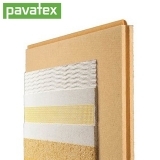 Pavadry is another innovative product from Pavatex, that is designed for retro fitting walls. 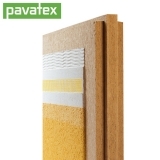 Pavadry is a wood fibre insulation hardboard that comes with a standard plasterboard finish, and achieves a u value of 0.042 W/m2K.